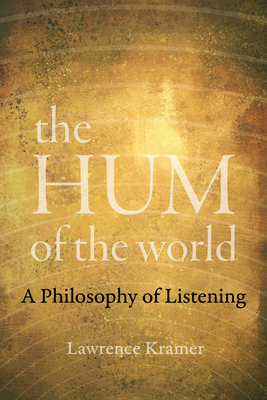 The Hum of the World is an invitation to contemplate what would happen if we heard the world as attentively as we see it. Balancing big ideas with playful wit and lyrical prose, this imaginative volume identifies the role of sound in Western experience as the primary medium in which the presence and persistence of life acquire tangible form. The positive experience of aliveness is not merely in accord with sound, but inaccessible, even inconceivable, without it. Lawrence Kramer’s poetic book roves freely over music, media, language, philosophy, and science from the ancient world to the present, along the way revealing how life is apprehended through sounds ranging from pandemonium to the faint background hum of the world. Easily moving from reflections on pivotal texts and music to the introduction of elemental concepts, this warm meditation on auditory culture uncovers the knowledge and pleasure made available when we recognize that the world is alive with sound. Lawrence Kramer, Distinguished Professor of English and Music at Fordham University, is an award-winning composer and the author of fifteen previous books, most of them with University of California Press, including The Thought of Music, winner of the 2017 ASACP Virgil Thomson Award for Outstanding Music Criticism.